After spending its first eight years at The Evergreen State College, the South Sound Relays found a new home this year at Curtis High School. The change in venues did little to slow down the Olympia High School girls’ swim team. The Bears won 6 of the 11 events at the 9th annual South Sound Relays, a meet that consists solely of relay races, on September 22, to claim the overall team title for a remarkable 7th time. It marks the third consecutive crown for Olympia, which collected a meet-high 972 points. Puyallup finished second with 888, while Aberdeen took home the third-place trophy with a total of 786. Steilacoom (640 points), Rogers (544), Black Hills (432) and Lakes (297) rounded out the order of finish among the seven-team meet. Olympia’s Lauren Wilson, who was a 4A state participant in the 100 fly, 100 backstroke and 200 medley relay last year, was a part of four relay teams that claimed first-place finishes. The sophomore helped the Bears win the 400 freestyle relay, 2×200 backstroke relay, 2×100 fly relay and 400 medley relay. The Bears opened the meet by winning the 400 medley relay with the team of Jang, Song, Wilson and Moore stopping the clock in a speedy 4 minutes, 16.12 seconds. Norman and Carissa Putt made it consecutive wins for Olympia after triumphing in the 2×200 freestyle relay. The duo’s winning time was 4:23.23. Steilacoom, last year’s fifth-place finisher in the 2A state team standings, took first in the 2×100 freestyle. Olympia got a second place in the event from Anna Daniels-Brown and Putt and a third from Lucy Skiles and Myers. After failing to finish among the top three in the 200 freestyle relay, the Bears closed out the meet by sweeping the final three events, beginning with Wilson and Jang’s victory in the 2×100 backstroke (2:07.00). 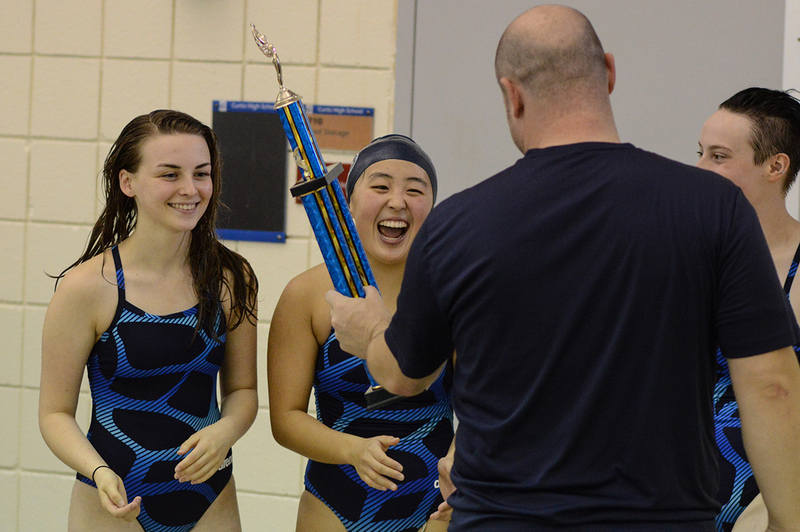 Song and Myers followed that win up by taking first in the 2×100 breaststroke (2:27.89). Olympia notched its last victory by winning the 400 freestyle relay as the team of Skiles, Wilson, Daniels-Brown and Moore posted a time of 3:53.25 during a thrilling finale, which saw members of every team crowd the lanes to loudly cheer on their teammates. According to Smith, Olympia has 49 swimmers on his team this year, marking one of the largest rosters in program history. Black Hills didn’t go home empty handed as the team of Rylee Denney and Emma Prybylski won the 2×100 IM relay (2:13.20). 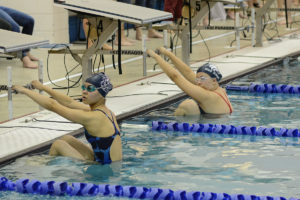 The Wolves also received a fourth-place finish in the 2×100 fly relay with Prybylski teaming up with Brielle Bryan and a third place in the 200 freestyle relay. Prybylski, Denney, Bryan and Kalli Bishop comprised the team. Black Hills finished fourth at the 2A state meet in the event last year. Prybylski finished seventh in the 500 free and eighth in the 200 free at the 2A state meet last season, while Denney was third in the 100 fly and sixth in the 200 IM.